Following a stint as chef and creative director at Austin’s Japanese restaurant chain, Uchi, Texas native Nicholas Yanes has gone solo, this time focusing on Northern Italian food in the city’s emerging east side. For the design, Yanes called on local firms Sanders Architecture and Cravott Interiors to transform an industrial mid-century warehouse with soaring 18-ft ceilings, which was formerly home to a bottling company. 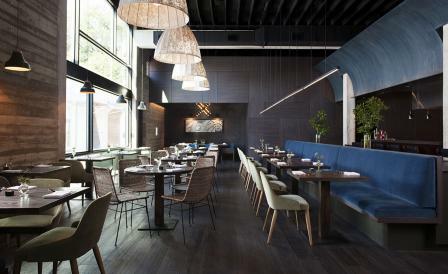 The finished space was inspired by the green hues of a juniper tree and includes an open kitchen – with chef’s counter seating – and a layered mix of rich, textural finishes such as natural woven detailing and velvet upholstery. The traditional Italian dishes on the menu are infused with a bit of Texas, like the brisket Bolognese. It’s the puffed potatoes with whipped Dijon mustard that have quickly become a favourite among the regulars.